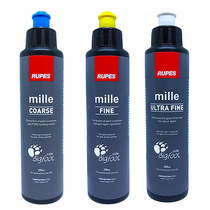 RUPES BigFoot Mille Polising Compound Mix & Match Trio will take you for cutting and polishing to final ultra fine polishing. 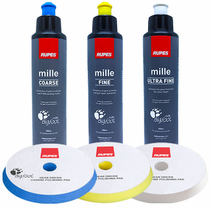 The innovative RUPES BigFoot gear driven polishing system bridges the gap between rotary buffers and DA polishers giving the advantage of saving time while safely maintaining the integrity of the paint. 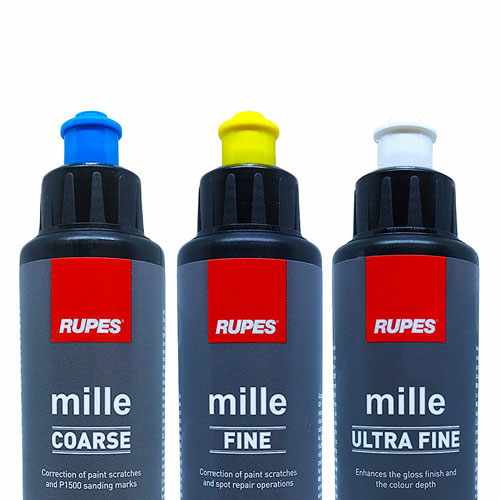 All of the RUPES BigFoot Mille Polishing Compounds were specifically formulated to work with the unique gear driven movement of the RUPES BigFoot Mille LK 900E Gear Driven Orbital Polisher and color coordinating RUPES BigFoot Gear Driven Mille Foam Pad for phenomenal results.